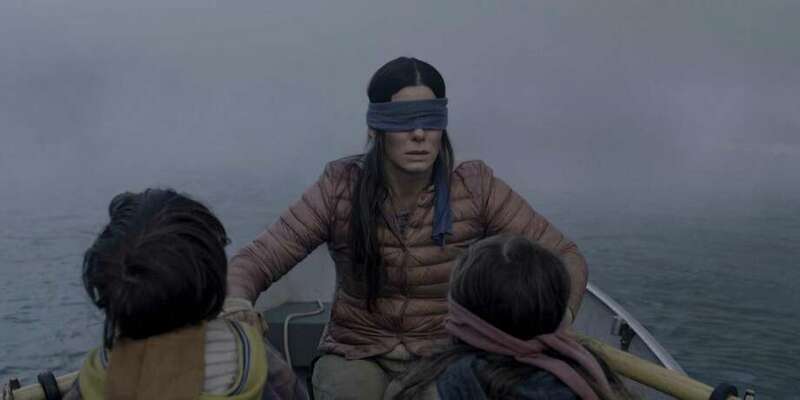 This image released by Netflix shows Sandra Bullock in a scene from the film, “Bird Box.” Netflix lifted the usually tightly sealed lid on its viewership numbers in a recent tweet that disclosed 45 million subscriber accounts had watched the thriller, “Bird Box,” during its first seven days on the service. That made the film the biggest first-week success of any movie made so far for Netflix’s 12-year-old streaming service. Netflix’s streaming post-apocalyptic horror thriller presents a world in which most of the global population has committed violent suicide. The only way to survive is not to ‘see it,’ whatever it is that is causing this mysterious, malevolent plague. As her story begins, Malorie Shannon (Sandra Bullock) is sternly instructing her two blind-folded children, Boy (Julian Edwards) and Girl (Vivien Lyra Blair), about navigating the white-water trip they’re about to embark upon in a rowboat. A five-year earlier flashback reveals two horse-loving sisters — cynical, reluctantly pregnant Malorie (Sandra Bullock) and free-spirited Jessica (Sarah Paulson). After the supernatural annihilation strikes, Malorie takes refuge in a house with other strangers. There’s Douglas (John Malkovich), the self-serving homeowner; frightened Olympia (Danielle Macdonald), who is also pregnant; Charlie (Lil Red Howery), an amiable supermarket employee who’s writing a novel about humanity’s end; savvy Greg (BD Wong); and sensitive Tom (Trevante Rhodes), an Iraq War vet — among others. Choosing the option to live, rather than simply survive, Malorie uses radio communication to locate a community where people are seemingly unaffected by the terror and embarks on a treacherous journey to transport her children to this safe haven. Based on Josh Malerman’s 2014 sci-fi novel of the same name, it’s adapted by Eric Heisserer (“Arrival”), directed by Danish filmmaker Suzanne Bier (“The Night Manager”) and photographed by Salvatore Totino (“Spider-Man: Homecoming”), effectively accompanied by Trent Reznor and Atticus Ross’ ominous, unnerving score. FYI: Risking life and limb, overzealous internet fans have posted a “Bird Box Challenge” in which blindfolded people foolishly attempt dangerous tasks. Popular YouTuber Morgan Adams, whose channel has 2.3 million subscribers, posted a video of being blindfolded for 24-hours. On the Granger Movie Gauge of 1 to 10, “Bird Box” is an intense, enigmatic 8 — about the psychological struggle of parenthood.